Definitely! For so many years Cream of Wheat cereal has been a nutritious, calcium enriched, creamy Breakfast prepared and eaten during the cold winter months. On a brisk winter day this cereal just hits the spot! It takes little time to prepare and tastes so good. After enjoying a wonderful Christmas with family and eating special foods, it was time to get back to a routine. This morning I glanced over to our Fruit Bowl. One remaining piece of fruit was in the Bowl - an overripe Banana. 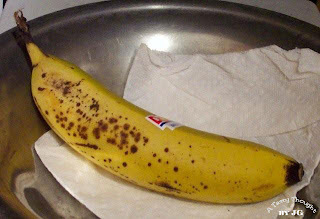 No, an overripe Banana is not a piece of fruit that I find yummy. But, it would be bursting with flavor. This morning the lonely spotted Banana was cut into slices and placed in the pot containing the Cream of Wheat granules and the Milk. Following the directions on the box, Breakfast was ready quickly. Ah, Banana flavored Cream of Wheat! Now, that is one tasty breakfast! As this year comes to a close, and a new year is around the corner, I wish all of you, my Blogging Friends - Happy New Year!!! Today both pieces of my rose colored Pyrex was taken out of my kitchen cabinet. I remember purchasing these two pieces as a set from my local grocery store probably fifteen years ago. They are used often! At Christmas time these pieces of Pyrex are used to make two very easy, quick and yummy treats. 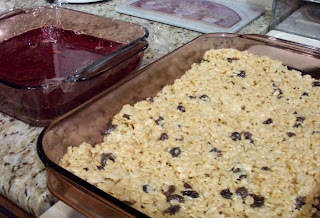 Whenever my sons were “back home” while attending college, Raisin Rice Krispies Bars and Jello Jigglers would be located in our fridge. Very quickly, I became aware that after a rapid walk through of our home to check out the familiar surroundings, the tour would always end with the opening of the fridge door. Then, smiles would appear! 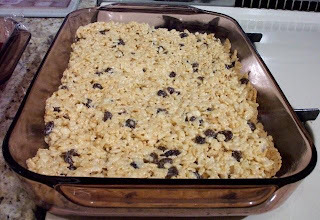 The Raisin Krispies Bars (click here) always contained Raisins. However, the flavor of the Jigglers would be a surprise. Today, Strawberry Jigglers were made. 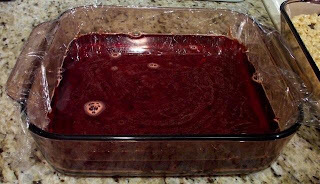 The recipe is on the box of Jello Gelatin. Children of all ages love those two treats! Do you make either or both of these yummy goodies? Enjoy this time of year! May You and Your Family Have a Very Merry Christmas!!! The temperature outdoors reminds us to wear the winter hats and the warm gloves when we bundle up! It certainly is a tad chilly! Christmas is just around the corner, so it is the perfect time to bake a batch of HERMITS. Hermits are moisty, chewy Molasses and Raisin cookies that are baked in three rolls on one large cookie sheet. Yes, you guessed it! They are a family favorite! Whenever Hermits are baking in my oven the wonderful aroma of Cinnamon, Ginger and Cloves fills my home. Yummy! Two weeks ago I baked a batch of Hermits to share with my Docent friends at our annual December Holiday Luncheon. Every year after our delicious Lunch, we all sample the mouth-watering cookies that everyone has brought to our yearly gathering. There are cookies to bring home, too! 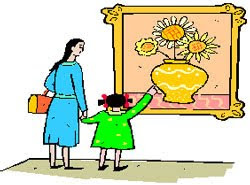 During the year we Docents volunteer at the Springfield Museums by giving tours to school groups. The Springfield Museums are a group of five museums that contain Art, History and Science. The Quadrangle (as it is called) is one of my favorite places. Can you tell that I enjoy visiting museums? Do you, also? There is always so much more to learn. With the holidays approaching another batch of Hermits will be prepared this weekend. After the individual cookies have been placed in the cookie canister, it will be hard to eat just one! Do you bake Hermits? If you would like to bake a batch, my recipe is below. Or click here for a printable Recipe Card. 1. Using mixer, beat Shortening, Sugar, Molasses & Water. Beat until creamy. 2. Reserve about 1 tsp. of Egg. Add Eggs & beat. 4. Fold in raisins by hand using a big spoon or spatula. 5. Spray PAM on a large cookie sheet. 6. Divide dough into three pieces. Make three rows of dough on cookie sheet, leaving about 1 ½ ” border on each end. Dough is very sticky. 7. Coat top with reserved Egg – use back of teaspoon to spread. 8. Bake in preheated 375° oven for 22 minutes (gas oven). 9. Cool 15 minutes & cut into diagonals. I throw away end pieces – too hard after cooled. 10. Store in container after cooler. Preparing for the holidays keeps all of us busy! One project is underway and another seems to be in the forming stages. It certainly keeps us moving and humming along. 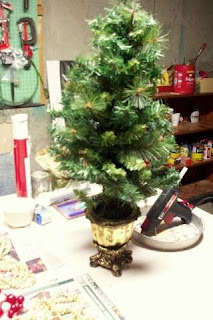 Yesterday, decorating the new small artificial trees for our front doorstep required using my hubby’s Workshop. Now, I am very acquainted where everything is located in my Kitchen and in my Sewing/Computer Room. However, I usually do not venture into the Workshop, so I can never easily locate the glue sticks and the glue gun. Actually, the easier method was to ask for help in locating everything I needed, because I also wanted to use my hubby’s large workbench. After my Christmas trees decorating project was completed, it was time to start dinner. 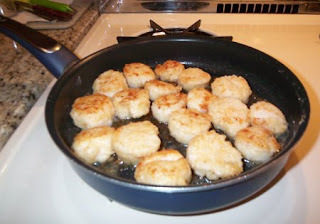 Earlier in the day Sea Scallops were purchased at our local grocery store. It was frigid outdoors, but the aroma of Pan Seared Scallops (click here) on my stove reminded me of the warm days of summer. The “Baked Potatoes” were in the microwave and a nutritious, colorful veggie salad was already on the table. A yummy dinner was ready quickly! Do you also enjoy preparing and eating Seafood during the colder months? After dinner my knitting needles were clicking away making progress on the black knitted hat! 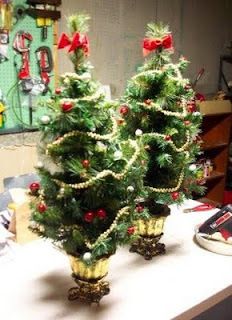 Are you working on projects for the holidays? At special times of the year do you bring out the Colored Sugars, a Rolling Pin and many cookie cutters? While glancing through pages in magazines or while watching food shows on t.v. you may get the urge to roll out, decorate and bake cookies. For about three decades I have been making Sour Cream Sugar Cookies. Goodness, it has been that long! (Click here for printable recipe card.) These cookies are made in two steps. The result is an absolutely delicious, soft, cutout cookie with a hint of Nutmeg. The dough for these Sugar Cookies is prepared on Day 1. After making the dough wrap it in plastic wrap and then in foil. Place the wrapped dough in the fridge. The next day – Day 2 - the dough is rolled out. Using your Rolling Pin and favorite cookie cutters a batch of delicious homemade holiday cookies will be ready! After you bake these yummy Nutmeg flavored cookies, they can be cooled and placed in your freezer. When the holiday arrives defrost them. Your family and friends will enjoy eating these scrumptious treats. With Christmas just around the corner, I need to get busy and bake a batch this week! After we eat a few, most of them will be located in my freezer until Christmas arrives. Do you bake special cookies for the holidays? What cookies do you traditionally bake? Sour Cream Sugar Cookies are my family’s favorite Sugar Cookie. It is difficult to eat just one! Earlier this morning before Breakfast I glanced over to the fruit bowl on my kitchen counter. One overripe Banana remained. Hmmm, it did not really look very appetizing. Then again, Bananas have never been a favorite fruit of mine, so I cannot imagine that a piece of yellow fruit speckled with brown spots would be very appealing to me. Yes, I’ve read articles stating that Bananas contain Potassium. O.K., I get that. I eat one almost every day, but it has to look “just right”. Bananas are not juicy and scrumptious to me like Oranges and Apples are. For that reason I like to hide them in other foods. Oatmeal is a great example! On a chilly morning a bowl of Creamy Oatmeal prepared with Quaker Old Fashioned Oats tastes so good. Especially if it is flavored with Cinnamon, Brown Sugar and Nutmeg. Having a little Banana flavoring does not hurt this tasty, healthy bowl of warm cereal. Actually, it is quite delicious! After enjoying a wonderful Thanksgiving my fridge is mostly empty, but a partial carton of Soy Milk was located. So, I had plans for the remaining piece of overripe fruit. Following the directions on the Quaker Oat canister for preparing Oatmeal, I added in one overripe Banana that was cut into slices. In preparing Oatmeal, I omit the Salt and sprinkle in Cinnamon, Nutmeg and Brown Sugar - according to taste. If the combo sits in the pot for 5 minutes before applying the heat, a creamier Oatmeal is the result. The flavor was great and the Banana slices melted, so they were not even noticed! It made some pretty tasty oatmeal! Do you enjoy warm Oatmeal on a cold morning? Looking outdoors it is a typical November day in New England. A gentle breeze rustles a few of the remaining leaves on the tree branches. The sky is gray, but inside my home the picture looks quite different. Butternut Squash Bread is baking in my oven. Yesterday, the Apple Bread was baked, cooled, wrapped in foil and placed in the large freezer downstairs. (Click links for printable recipe cards.) Tomorrow, baking Cranberry Bread is on the agenda. Wednesday, the day before Thanksgiving, has always been my piemaking day - Cherry, Mincemeat and Butternut Squash Custard. Everyone in my family has two favorites of the three choices, except for me – I like all three! Two days after Thanksgiving it is a tradition for my family to enjoy Turkey a la King for dinner. I substitute chunks of Turkey for Chicken in the recipe. It is quick and easy! Do remember the Cranberry Sauce! This past weekend my sewing machine was humming along. I spent some time creating and adding autumn embellishments to new guest towels. Jo-Ann Fabrics & Crafts has the cutest fall fabric. Soon, I will be working with the Christmas fabric that I purchased. 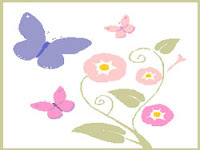 Do you visit Jo-Ann’s and see visions of items that you may make? I sure do. 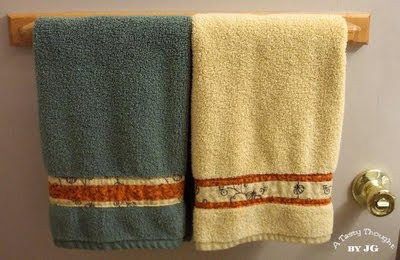 That is how my Guest Towel Project started. Now, I am almost ready for Thanksgiving! 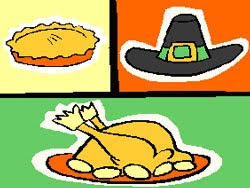 Later this week when you get together with family members/friends have a wonderful Thanksgiving! It is a great time of year to remember all of the good things that we have and do for others and also the helpful people that we know. Plan B to the Rescue! Last Sunday afternoon I was determined to try a new muffin recipe. 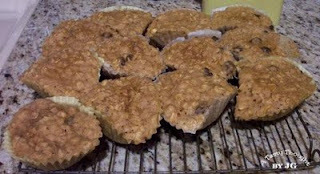 The Applesauce Oatmeal Raisin Muffin batter was placed in the muffin liners. My timer buzzed, so I KNEW that my oven was pre-heated and the muffin tray could go in. My oven takes 20 minutes to pre-heat, so that is my time frame to work fast and get the food ready for the baking phase. However, on Sunday afternoon I was not attentive to the fact that my stove was not getting hotter. Somehow, a Plan B usually steps in. No, it was not buying a dozen muffins from the local donut store. Gazing up at my trustworthy Spacemaker Microwave (of 20 years) I remembered a section in my Microwave Cookbook on “baking” muffins in the microwave. Time to take out that cookbook! 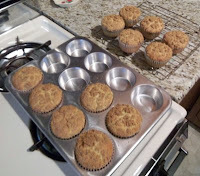 Following the directions and using a small Pyrex pie plate, four muffins cooked at once in triple paper liners. The result – moisty, yummy and quite unusual shaped muffins … but they do taste great! On Monday we called John, our local, reliable appliance repairman. He arrived in the afternoon and replaced the oven’s electronic igniter. Thank you, John! That afternoon we ordered the fresh turkey for Thanksgiving Dinner from our local grocery store. The timing for my oven to need some attention was perfect! 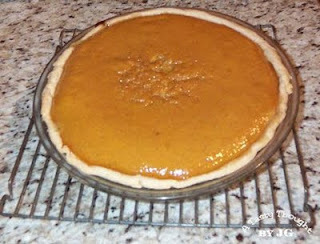 Thanksgiving would not feel the same if I was not able to use my mom’s Butternut Squash Custard Pie recipe (click here) and bake the pie two days before our dinner! The tradition of my family savoring a slice of the pie with a dollop of whipped cream lives on! We will enjoy this pie, again! On a damp, chilly day a bowl of homemade soup that has been simmering on the stove tastes so good! 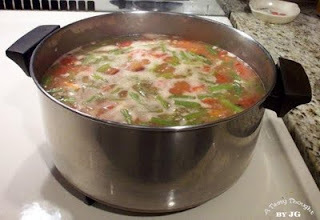 Yesterday, the overcast sky brought showers, so it was definitely a day to make Great Minestrone. Great Minestrone (click for recipe) is filled with colorful, nutritious vegetables. Three 14.5 oz. cans of College Inn Light and Fat Free Chicken Broth were added to the combination of veggies along with some herbs. In my pantry was a box of Orzo, so I used 1 Cup of Orzo rather than Macaroni. Everything simmered in my 4-quart pot for 45 – 60 minutes. The wonderful aroma in my kitchen helped erase the gloomy weather outdoors. Oh, the soup smelled so good while it was bubbling. I stirred it occasionally while it was simmering. Before serving, I noticed that it was a little thick, so I added one additional 14.5 oz. can of Chicken Broth and heated the Minestrone for a few additional minutes. It simmered once again. The Orzo had absorbed liquid while cooking. After enjoying a warm bowl of Great Minestrone with dinner, as usual, there were extra portions. After cooling, the extra soup was placed in labeled/dated Ziploc Freezer containers and stored in my freezer. On another chilly day a warm bowl of soup will taste scrumptious! This soup can be defrosted overnight in the fridge. To prepare place in a pot along with an additional 14.5 oz. can of Light and Fat Free Chicken Broth. More bowls of delicious, homemade soup await. At this time of year grocery stores offer specials on College Inn Chicken Broth. Yes, I do stock up on the 14.5 oz. cans. It is great to use when making Great Minestrone, Stuffing and also preparing Rice. At this time of year in Western MA yard work is a must! In many families either Saturday or Sunday brings out the raking/blowing leaves detail. 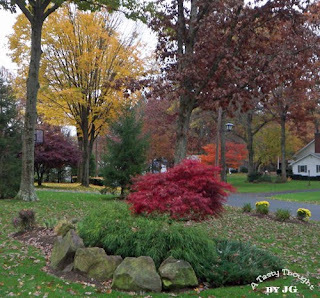 We had been enjoying the long lasting colorful beautiful leaves on all of our trees this fall. 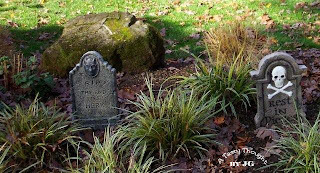 But, at some point we knew that an abundance of leaves would flutter downward forming a carpet on our lawns. Most leaves are brown. Others are red or a golden color. 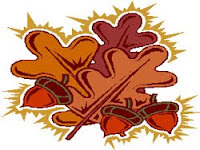 There are town residents who hire local landscape services to remove the leaves. Other families take on the yearly challenge themselves. My hubby takes on this challenge for us. Now, if you are planning on spending time outside taking care of the leaves detail on the weekend, a hearty breakfast is a must. Pancakes are an all time breakfast favorite in my household. Sitting down for breakfast and enjoying Awesome Oatmeal Pancakes is the best! After eating one bite you might ask - Is Oatmeal really an ingredient in these pancakes? They are very light! These tasty pancakes are prepared in two steps. Step 1 - The evening before the pancakes will be made on the griddle, old-fashioned oats and buttermilk are mixed together in a large bowl and refrigerated. Now, I have learned that doing this step about 16 hours before Step 2 results in lighter Awesome Oatmeal Pancakes. (Click for recipe). Oh yes, they do freeze well, also. After breakfast, cool any extra pancakes. Each one can be placed in a separate sandwich bag and then stored in a labeled/dated Ziploc Freezer Bag. It makes for a great breakfast on another busy morning with the aid of a microwave! Do you prepare pancakes? What kind do you make? Are there any extra pancakes after breakfast that you could place in your freezer? One evening last week my older son sent me an e-mail with a request – Could you send me the Snickerdoodles recipe? A mom who loves to cook and to bake will respond to this type of request very quickly! It dealt with baking. I also knew that if he wanted a particular recipe, it was definitely a favorite from his childhood. When he was an undergrad in college I baked, packaged and mailed (click here) these soft, yummy cinnamon flavored cookies to him. A couple of years later, packages were mailed to his younger brother. This treat has also been mailed as part of birthday presents. Now, his request could be answered very easily with a click here and a click there. 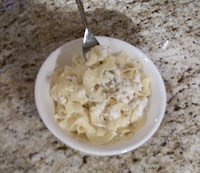 On my website I posted this scrumptious recipe, perhaps one year ago. Clicking on the link would give my son easy access to a printable recipe card (click here). O.K., I did add these little extra instructions: Store the cookies in an airtight container - they last about 3 - 4 days, before becoming a little crispy. Usually this favorite is eaten by then, anyway. And ... they do not freeze well. Ah, Snickerdoodles, I need to bake a batch this week, also. :) Soon, I will be getting a text message telling me how everything worked out. Do you bake Snickerdoodles? You and your family would enjoy them. Snickerdoodles look and taste so good! After the tasty cookies are baked, our cookie canister is emptied quickly. For that reason, I never have a picture to share of this delicious family favorite. During the daytime red, orange and golden colored leaves confirm that October is here. Then, cold, and dark nights hide the beautiful scenery of late October. Halloween is just around the corner. It is time for Halloween Sherbet Punch! 1. In large punch bowl place 1 Quart of Sherbet. 2. Pour (2) bottles of chilled Diet 7-Up in punch bowl, pouring some over sherbet. 3. Stir a little to mix ingredients. 4. Will result in frothy top and softened sherbet. 5. Ladle into cups, adding some of the softened sherbet. 6. Replenish the Diet 7-Up and sherbet, as needed. The goblins in your family and friends will enjoy the beverage you have brewed! Add Plumped Craisins & Raisins! Autumn in New England! What a great season! Apples and apple cider taste so good. The crisp mornings are preparing us for the chillier weather that is in our future! Usually when the mornings are a bit cool in October I think of creamy Oatmeal for breakfast. The recipe on the canister of Old Fashioned Quaker Oats is the favorite. Using Old Fashioned Oats, Cinnamon, a dash of Nutmeg, Soy Milk, Brown Sugar, and a few Plumped Craisins and/or Raisins, a hearty bowl of warm, steaming, creamy and delicious cereal hits the spot in the morning! Craisins and Raisins always taste so good. I like to give them a tad extra flavor by soaking them in Apple Juice. A one-cup Ziploc container of each fruit soaking in apple juice is usually found in my fridge. Sometimes, I use Cranberry Juice. Quite often when baking, I will add them to a recipe. 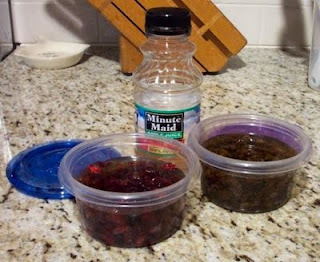 Place about ¼ cup dried fruit in 1 Cup Ziploc container. Add Apple Juice to cover dried fruit. Cover and refrigerate for 1 – 2 days. Use within 2 weeks. Oatmeal is one food where these plumped fruits are added for nutrition and for taste. I will share more, another time. 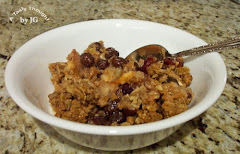 Do you enjoy raisins/or craisins in oatmeal? Watching Football games was definitely on the agenda this past weekend! On Saturday afternoon my hubby & I bundled up for the cold evening and drove to Chestnut Hill to attend the exciting Boston College Football game. It was a crisp, cold night in the Boston area. Brrrrr! Sunday morning arrived much too soon and the Patriots game would start in the late afternoon. The cold, dark day brought rain here in Western MA. After turning on our t.v. and looking at the screen to watch the Pats game, we could see white particles falling from the sky! Snow? Yes! Snow in mid October is just too early. Exciting, but too early! It was around then that I realized I needed to forget the snow falling in the eastern part of our state and give some thought to our dinner. Sometimes, opening the freezer door answers a quick question regarding what is for dinner! Now, sitting in our freezer was a Ziploc Container packed with “leftover” Chicken Florentine a la Slow Cooker. Earlier in the week this meal was prepared in my Slow Cooker (like a Crock Pot). It made for a scrumptious, colorful, nutritious dinner on Tuesday. The “leftovers” were placed in a Ziploc Container along with some cooked broccoli (from another meal). Locating this labeled and dated container in my freezer was like hitting the dinner jackpot! It did not take long to defrost and heat this yummy dinner in the microwave in a covered piece of CorningWare. This appetizing find was placed over No Yolks Noodles. While the pasta was cooking, the microwave helped to prepare our dinner. Dinner was a snap. And … it was so good! Place Baby Carrots in a large bowl and rinse with cold water. Then place Carrots into Slow Cooker’s cooking pot that has been lightly sprayed with PAM. Rinse about 1 & ½ lbs. Chicken Tenders in cold water and place on Carrots. Sprinkle about 1 Tbs. Parsley and 1 Tbs. Chopped Onion on top. Defrost (1) 10 oz. pkg. 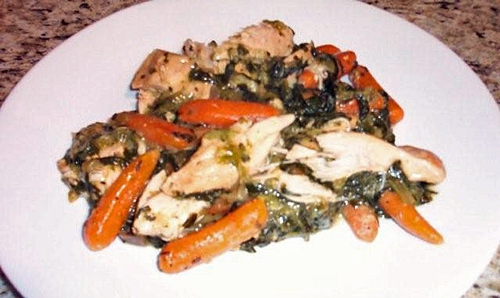 frozen Spinach and spread on top of Chicken. Then, sprinkle about ¼ tsp. Oregano, ¼ tsp. Basil, and ¼ tsp. Garlic Powder on top. Mix 1/3 Cup Water with (1) Can Cream of Mushroom (Healthy Request) Soup in a small bowl. Spread mixture evenly over top. Place the lid on top of the cooking pot and set the temperature. Cook on #5 (High) – 1 Hour. Then reduce to #3 for 2 Hours. 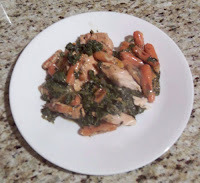 Sometimes I use Potatoes and at other times I use Baby Carrots when making Chicken Florentine a la Slow Cooker. Any leftovers that have been placed in the freezer, reheated and served over No Yolks Noodles make for a quick, easy, tasty dinner. I was so happy to find this meal in my freezer on Sunday! Do you use your Slow Cooker or Crock Pot? What do you prepare? A meal made in a Slow Cooker or a Crock Pot just hits the spot! Easy and delicious! Butternut Squash Bread – Another Tradition! The chilly October mornings are here! Maple trees are adding beautiful colors to our neighborhoods. Our local news is filled with stories of visitors enjoying picturesque New England in the autumn. We residents need only to venture outdoors while completing errands to relish the scenery. With this season comes pumpkins and varieties of squash and cabbages. Yesterday, after preparing the local Butternut Squash for our freezer, I saved two cups of the mashed orange cooked vegetable. Later in the day, the squash was used in making Butternut Squash Bread. I continue my family’s tradition of using Butternut Squash as an ingredient in bread rather than steaming a pumpkin or using canned pumpkin. The delicious taste of a slice of Butternut Squash Bread is difficult to resist. Click here for recipe card. Now, I substitute Olive Oil for vegetable oil while cooking, so I now use Olive Oil as an ingredient rather than vegetable oil in this yummy bread. This recipe yields two breads. Cut the ingredients in half if you wish to bake one bread. However, this bread freezes very well, and it is a welcome sight in my freezer when we locate a homemade, made from scratch dessert ready to be thawed and served. And … it makes a great surprise for an out of town guest! Do you use Butternut Squash rather than pumpkin when baking? Next, I will be baking Butternut Squash Muffins! Last Friday morning I envisioned eating French Toast topped with maple syrup for breakfast. Now, I was not planning on taking the milk and the eggs from our fridge to make this breakfast. My plan included the simple act of searching in my freezer to locate Raisin Cinnamon French Toast and heating it in our microwave. Well, that was not in the cards! An additional item was quickly added to my grocery list – Pepperidge Farm Raisin Cinnamon Bread. On Saturday morning the milk and the eggs were located in our fridge and the griddle was heated. Golden, delicious, sweet Fantastic French Toast was on our breakfast table. Yes, there were extra pieces. After they cooled, each piece was placed in a sandwich bag. The sandwich bags were then placed in a Ziploc Freezer Bag, labelled and stored in the freezer. ***For many years I prepared this scrumptious breakfast using Cinnamon Bread. However, one day my son suggested I just try making it with Raisin Cinnamon Bread. Raisins are tops in my family, as you can guess. I used the bread containing the raisins and found it top notch French Toast. From then on Raisin Cinnamon Bread it was! There will be another busy morning when I will search for French Toast in our freezer. On that morning the microwave will help with another very tasty breakfast. Yummy! When making Fantastic French Toast, I use Egg Whites to cut back on the cholesterol. Click here for printable recipe card. 2. While beating mixture add in Milk and continue beating to combine. 3. Heat non-stick griddle or skillet on medium heat. 5. The underside will be golden brown when it is time to turn the bread slice over with a spatula. 6. Turn over and brown other side. 7. Serve with Maple Syrup. While using a recipe that calls for Pumpkin have you ever replaced Butternut Squash for the Pumpkin? I always do. My mom was a great cook and I learned that little tidbit from her. 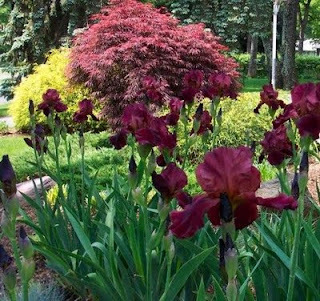 While growing up, my family always had two large gardens. Every year Butternut Squash were harvested in September. Some were stored to eat in the Fall, but most of the squash was steamed, mashed, packed in plastic bags, dated and placed in my family’s large freezer. When my Hubby & I lived in an apartment we did have a garden and bought an upright freezer. Now, we no longer have a family garden, but we purchase a bushel of Butternut Squash every September from Meadowbrook Farm in East Longmeadow. We prepare the squash and freeze portions in Ziploc Bags that will be enjoyed all year at dinnertime. And… yes, yummy desserts will also be baked in my oven. One family favorite dessert is Butternut Squash Bread. Butternut Squash Bread is on my agenda this week! I always bake two breads. One is enjoyed after it cools, when it can be sliced. The second bread is cooled, wrapped in foil, labelled and placed in our freezer. For the recipe click here and a printable recipe card awaits. This recipe yields two breads. We also enjoy this bread on Thanksgiving morning. If you wish to bake one bread, use half of the ingredients listed. Yes, I have replaced some of the Eggs with Egg Whites – it is that “watching cholesterol thing” that I try to do. When baking One Whole Egg equals Two Egg Whites. Butternut Squash Bread is absolutely yummy! Autumn is Around the Corner! Yes, we are enjoying the crisp September mornings here in New England! Before the blink of an eye, Autumn will arrive. Yesterday, the afternoon sun felt good, so it was an invitation to use our outdoor grill while making dinner. Grilled Pork Tenderloin – ahhh yummy! While the Pork Tenderloin was grilling, the Easy Cheesy Noodles were on their way. Cut Cantaloupe was already in our fridge. Our dinner was easy to prepare and tasted sooo good! 1. Pour Olive Oil on a large dish. 2. Now sprinkle the spices listed above on the Olive Oil. Use 2 – 3 shakes of jar or 1/8 tsp. of each, according to taste. 3. Rinse meat under cold running water. 4. Place on large dish with Spices and Olive Oil. 5. Turn meat over and coat with oil mixture on all sides and on ends. 6. After heating the outdoor grill, place the meat on the hot grill. 7. Grill about 25 – 30 Minutes (until cooked) turning over once. Do you grill Pork Tenderloin? Have you tried Easy Cheesy Noodles? Both foods are family favorites in our home! 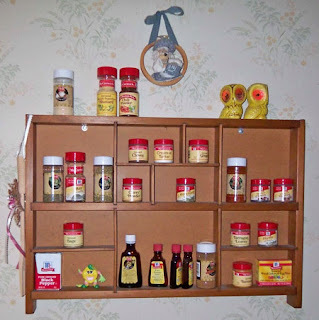 Whenever I need to use a spice, I reach into my Spice Rack. My hubby built it to resemble a “shadow box”. Blue Skies and Grilled Swordfish! Today, we are enjoying a very comfortable day here in Western Massachusetts! The Peachy Craisin Crisp is baking in my oven and tonight our outdoor grill will be used! Ahhh, this week the seafood department in my local grocery store has a special on fresh “wild” Swordfish. 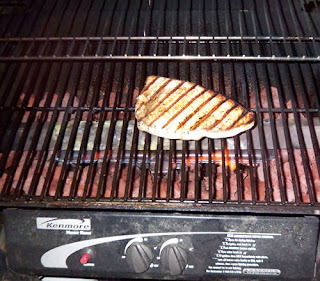 So … tonight for dinner we will enjoy eating Grilled Swordfish, a microwaved “baked” potato and a fresh garden salad. Guess what we are having for dessert? The preparation for Grilled Swordfish is very easy, the grilling time for the fish is not long, and the results are so yummy! 1. On a large dish pour about 2 Tablespoons Olive Oil. 2. Sprinkle a little Paprika on top. 3. After rinsing Swordfish Fillet in running cold water, place on the Olive Oil/Paprika. 4. Turn the fish over to coat the other side. 5. Place fish on heated Grill. 6. Grill about 5 – 7 minutes on each side, until fish flakes easily with a fork. Grilling Time depends on size & thickness of fillet. Seafood tastes great! Preparing it at home is the best! Using the outdoor grill just tops it off! Do you enjoy eating fish? What is your favorite? Do you grill it? The local peaches are so juicy and so delicious! I am fortunate that a veggie/fruit stand in my area sells this delicious fruit and it can be purchased in large quantities. The Peach trees are located not far away. Now, my fruit bins in the fridge are full of peaches. Yummy! Biting into a ripened juicy cold peach is the best! After making two batches of delicious Peach Freezer Jam there are still more peaches to enjoy. I made a tasty dessert - Peachy Craisin Crisp. 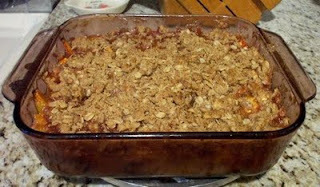 The recipe was easily found, because I used my Apple Crisp recipe - substituting fresh peaches for apples. *** To easily peel off the Peach skin before cutting into slices – Carefully, place each cleaned, ripened peach in simmering water for about 35 seconds. Remove the peaches from the hot water with a slotted spoon and cool on a plate. When the fruit can be comfortably handled, it can be peeled and cut into slices. 2. Spray PAM in 8”x 8”glass Baking Pan. 3. Place sliced Peaches in Pan. Sprinkle in Craisins and mix. 4. Mix remaining ingredients thoroughly in small bowl. Sprinkle over Peaches. 5. Bake 45 minutes or until Peaches are tender. 6. Serve warm or chilled with a scoop of vanilla ice cream. 7. After cool, cover and refrigerate any leftovers. Do you bake desserts using peaches? The fresh fruit is delicious! First Peppers and Then Slices of Peppers! What a beautiful sunny Monday! It was the day to go to the fridge and take out the Green Peppers that were purchased two days ago. Here in Massachusetts it’s great to visit a roadside veggie stand and purchase the local fresh produce. Our grocery stores carry the fresh products that are grown in our area, also. A few days ago locally grown Green Peppers and Peaches were purchased. One batch of Peach Freezer Jam will be made tomorrow. The Certo is waiting! 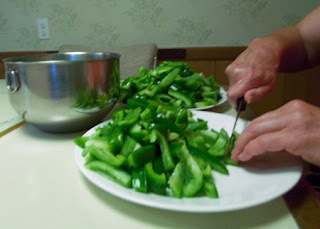 Today the Green Peppers were washed, cut in strips and placed in individual sandwich bags. The sandwich bags were then placed in Ziploc Freezer Bags and into the freezer they went! 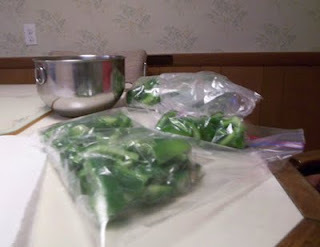 During the winter on a cold snowy day when I am making dinner I will reach into my freezer and take out a bag of sliced peppers to add. Peppers always taste so good when they are added into dishes containing tomato sauce. Do you add Green Peppers to main dishes? Do you have local veggie stands where you purchase your produce in the summer and early fall? A Tasty Tradition Includes Grilled Haddock! Sometimes, we repeat past actions and with their repetitions traditions begin! Spending a few days at Cape Cod here in MA definitely falls into that category. Relaxing and enjoying Nauset Beach in Orleans is an all time summer family favorite. Just before starting the journey back home, enjoying a Clam Roll on the Wellfleet Pier hits the spot. After enjoying a relaxing vacation, I am always eager to get back to my kitchen. The second night that we are back home “Grilled Haddock” is our entrée. This has happened for quite a few years. Grilled Haddock is quick and easy to prepare and tastes delicious! Add a microwaved “baked potato” and a veggie or fruit salad and a nutritious dinner is ready quickly! 1 lb. Haddock Fillet(s) serves 2. 1. Spray Grilling Basket/Container with PAM. 2. On a large dish pour about 2 TBS. Olive Oil. 3. Sprinkle a little Paprika and Thyme on top. 4. After rinsing Haddock Fillet(s) in running cold water, place on the Olive Oil/Paprika/Thyme. 5. Turn the fish over to coat the other side. 6. Place fish in Grilling Basket/Container on heated Grill. 7. Grill 5 – 7 Minutes on each side, until fish flakes easily with fork. Grilling Time depends on size/thickness of fillet. A Grilling Basket/Container is definitely needed, because the Haddock Fillet(s) can break apart while grilling. The amount of needed grilling time depends on the size of the piece(s) of the haddock and the grill. T’is the Season for Sherbet Punch! August has arrived and we have had two or three typical days of summers past! Not every day, but they do pop up here in the Pioneer Valley with the heat and the humidity. If you are having a gathering and have invited guests of all ages, include a punch bowl filled with Sherbet Punch (click here). On a hot, humid, sunny day a cup of this quenching beverage hits the spot! Orange, Raspberry and Lime are tasty. My family likes Orange. 1. In a large punch bowl place 1 Quart of Sherbet. 2. Pour (2) bottles of chilled Diet 7-Up in the punch bowl, pouring some over sherbet. 4. The result - a frothy top and softened sherbet. Mmmm! Sherbet Punch is so easy to make and it tastes so good! Blueberries, Blueberries and More Blueberries! Easier is so much better! On Thursday, my hubby & I drove out to Southwick and purchased a large quantity of the local, fresh, sweet, colorful blueberries. Yes, it’s Blueberry Season, but we really did not want to pick them ourselves! It was much easier to purchase them already picked! At the farm roadside stand, when a larger quantity is purchased, the cost/quart is much less. 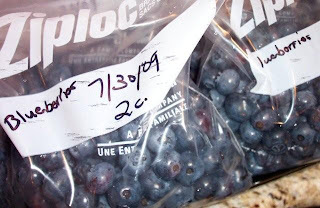 In the afternoon many Ziploc bags containing the delicious berries were packed and labeled. Our supply of blueberries for the year is now in our freezer. Yesterday afternoon two batches of homemade Blueberry Freezer Jam (click) were made, one batch at a time. Later today the containers will be placed in our freezer. The third batch of Blueberry Freezer Jam (click) will be prepared tomorrow. This morning Blueberry Pancakes (with cinnamon and nutmeg) tasted absolutely scrumptious at breakfast. The extra pancakes were individually placed in sandwich bags and then in a Ziploc Freezer bag. Into the freezer they went. On another morning we will enjoy them, again. When the fresh local blueberries are in season we totally enjoy them! Yes, more are in our fridge waiting to be enjoyed. Making Blueberry Delisimo (click) and Yummy Blueberry Muffins (click) is also on my agenda. A homemade Blueberry Muffin – Yummy! Do blueberries grown in your area? Do you purchase the fresh local blueberries? How do you enjoy them? Ahh, blueberries are so good! Yes! The fresh, colorful, nutritious vegetables are now found at our local roadside stands. Last night the chilly rain was falling outside my kitchen window, but inside my warm kitchen the green chunks of zucchini squash smelled so good! I was sauteing them in Olive Oil. 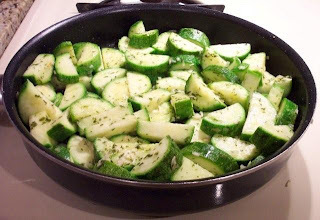 This quick and easy side dish is one that we enjoy often when the local zucchini is available. 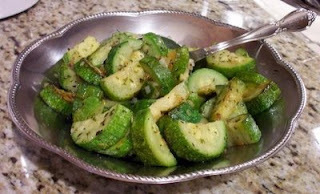 After washing 3 – 4 small zucchini in cold water, they were cut in slices. Each slice was then cut in half. 2-3 TBS. of Olive Oil were heated in a large skillet over medium heat. While sauteing the veggies, I added a few sprinkles of dehydrated Chopped Parsley, Chopped Onion, Oregano, Sweet Basil and Garlic. Saute until tender. Ahhh! Sometimes, I add slices of yellow Summer Squash along with sliced Green Pepper Sauteed Combo (click here). This is one of our favorite side dishes! Wow! 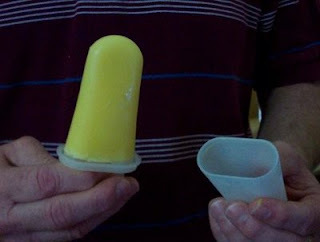 The white freezer pop molds and tray were packed away in the brown cardboard box for at least two years. So that’s where they were all this time! I could not remember where they were located, but I knew that I still had them … somewhere. Many summers ago when my sons were young children Pudding Pops could be found in our freezer to enjoy on a hot sweltering day. Yesterday, locating my Tupperware molds and the tray was a great find for me. So … it did not take me long to wash the molds/tray and use them after a number of years. While they were drying I prepared a box of Jello Cook & Serve Vanilla Pudding, according to package directions. After the pudding cooled for about 30 minutes, I spooned the creamy delicious pudding into the molds and attached the plastic sticks on the ends. Onto the tray and into the freezer they went. Today my hubby located these “Pops From the Past”. After devouring a Vanilla Pudding Pop, he happily announced that they taste as good as he remembered. Nice! 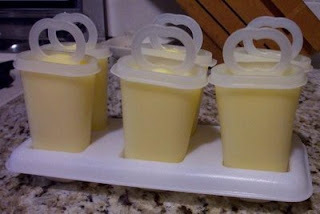 Pudding Pops are so easy to make. Easy is good! And … everyone enjoys eating this yummy treat. The freezer molds can be purchased during the summer months. My pudding of choice is Jello Cook & Serve. I like this brand, because the pot is always easy to clean after preparing the Jello pudding. Does your family enjoy Pudding Pops? Do you make them? What is your favorite flavor? Vanilla is mine! Do you like chocolate? Keep preparing easy nutritious delicious meals. Ah, Add A Little Lemon Peel! The sun was shining brightly in our backyard. Looking out my kitchen window I could see a bright red Cardinal perched on a branch. The temperature was in the mid 70’s, so pre-heating my oven added a little warmth to my kitchen. The Craisin Twists (click) were ready to be baked. 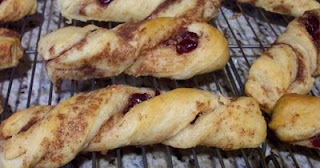 Whenever when I bake the Pillsbury Cinnamon Twists, I use Plumped Raisins and Plumped Craisins (click) to fill the inside before twisting the dough. However, there was only about ¼ cup of Plumped Craisins in the container in my fridge. It was enough to fill the 2 canisters of dough before the Twists were baked. This was the opportunity to open the jar of McCormick Lemon Peel that I had purchased a couple of months ago. To the ¼ Cup of Plumped Craisins I added about 2 tsp. Lemon Peel and stirred. Baking a double batch requires using my extra large cookie sheet and about 2 minutes and 30 seconds extra baking time. I follow the directions on the package and add the extra baking time. 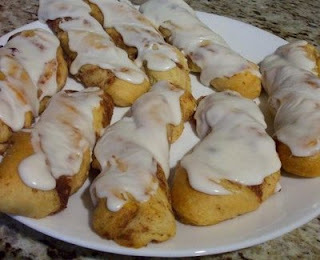 Baked Cinnamon Twists with the added fruit taste so good, especially after they are stored in the fridge! An extra plus to baking a double batch, is that after the Twists are iced, place all of them in the fridge, so the icing becomes firm. Later, the extra treats can be placed in a Gallon – sized Ziploc bag and stored in the freezer. If freezing, place them in a single layer. Whenever they are needed for breakfast, they only need to be defrosted! It’s Tangy Tortellini Salad Time! July is here! Happy Fourth of July!!! Yes, the outdoor grill has been used and it’s time for outdoor picnics! My recipe for Tangy Tortellini Salad has been retrieved. Later this afternoon the necessary ingredients to make this easy, delicious, colorful salad to enjoy on the Fourth of July will be purchased! 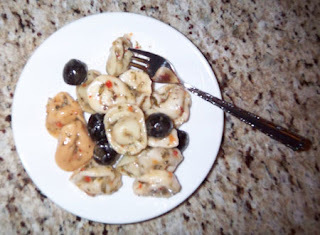 Tangy Tortellini Salad is prepared with a 12-ounce package of frozen Tri-colored Cheese Tortellini and Italian Salad Dressing. I also add in 1/8 tsp. Garlic Powder, 1 TBS. Chopped Parsley and ¼ Cup Black Olives (sliced in half). These ingredients are optional, but my family likes them. This salad is definitely a family favorite! 1. Prepare the Tortellini according to the directions on the package. 2. Drain and rinse with cold water and drain again. 3. Place the Tortellini in a bowl. 4. Add about ½ cup of Italian Salad Dressing and stir. 5. Add any optional ingredients. 6. Cover and refrigerate for at least 4 hours, stirring once or twice. 7. Before serving add extra Italian Salad Dressing, if needed. 8. Cover and refrigerate any leftovers. It was about a year ago that I wrote a similar post. Well, the end of June is here as is my tradition at this time of preparing the local fresh, juicy, luscious strawberries and placing bags of them in our freezer to be enjoyed all year. Some scrumptious strawberries are used to make Freezer Jam. As of three weeks ago we have no more Freezer Jam to enjoy on English Muffins or as a flavoring for Yummy Yogurt. Today two batches of Strawberry Freezer Jam were made – one batch at a time. The third batch will be on the agenda tomorrow. The Certo, Sugar and Ziploc containers had already been purchased and were ready to be used. Meadowbrook Farm in East Longmeadow, MA has delicious, large strawberries. It is definitely local Strawberry Season! Do you enjoy strawberries? Do you purchase the strawberries grown in your area? They are so good! One day last week, the Haddock fillets were ready to be placed on our grill. We would savour the taste of Grilled Haddock and veggies for dinner. However, my hubby came back inside to inform me that our grill was not working. Oh no! That required a Plan B … very quickly! My large skillet was located. I heated about 2 TBS. of Olive Oil in the skillet over a Medium heat. The fillets of Haddock were quickly breaded in about 1 Cup of flavored dry Bread Crumbs. Then, the fillets were placed in the skillet. After sauteeing each side of the fish for about 5 Minutes, the Breaded Haddock was ready to be enjoyed. Yummy! Ah, Breaded Haddock is very tender. Quick, easy and delicious! Today, the rain and showers continued here in the Pioneer Valley, so it was the perfect opportunity to use my large skillet for dinner, again. During the winter months this will be my method of preparation for Haddock fillets when my grill cannot be used. Sometimes out of necessity a food is prepared differently and enjoyed even more. Does your family enjoy eating Haddock? How do you prepare it? For me the expression “Cooking Up A Storm” does not always mean that my oven, my refrigerator or my herbs will be used. Yesterday afternoon a section of my dining room table was covered with colorful silk flowers along with a copper container and wire cutters. A day earlier my hubby had glued green foam into the bottom of the copper container. It would be the base for a silk flower arrangement gift that I was making for friends. Making floral arrangements is a relaxing hobby. After sniping the stem of the first flower to the desired height, the stem is inserted into the center of the foam. Then, another floral stem is cut and put in place - sticking out of the end of the foam and side of the container. Another flower is placed on the other side. After that … desired colors and varieties of silk flowers are added. No green foam will be visible when the arrangement is completed. While listening to a Billy Joel CD, colorful sprigs were carefully cut and pushed into the foam. One here, another there… Before I knew it I was finished. An advertised sale at Michael’s is as sweet as using coupons in the grocery store! Two weeks earlier I was able to purchase my silk flower supply for this project at a 50% discount. This morning the finished product was sitting on my counter. 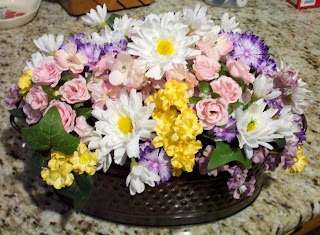 Do you enjoy making silk flower arrangements? Other than using your oven, how do you enjoy “cooking up a storm”? Oh, definitely! If you are using your Slow Cooker or Crock Pot to prepare Chicken Florentine a la Slow Cooker, add the Baby Carrots! Yesterday was a day filled with activities and they would last until later in the evening. Dinner would be eaten quickly. Now, there was a toss up. A quick “take-out” meal could be ordered, purchased and enjoyed, OR earlier in the afternoon I could use my trusty reliable Slow Cooker to prepare a delicious, colorful, fragrant, nutritious dinner. Well, I opted for the second choice and we were very happy with the results. In our fridge was a bag of Baby Carrots along with some remaining Chopped Broccoli from our dinner the previous night. With the exception of potatoes, all of the other ingredients for Chicken Florentine a la Slow Cooker were located in my kitchen. So – by substituting the carrots for the potatoes, I learned that a meal that I prepare quite often in my Slow Cooker could taste even better. It tasted so good with the carrots! Do you use a Slow Cooker or Crock Pot? It takes very little time for prep work and the meals are great! Today is the first day of the month – June has arrived. The beginning of June brought a new format to our local daily newspaper. Yes, I was aware that this would take place today, but I found our paper so small when it arrived on our driveway. It was a very quick read during breakfast. Much later this evening a new host of the “Tonight Show” will guide us into the next day. The monologue that I have grown accustomed to for many years will be absent. Well, times are changing! However, recipes for delicious, nutritious, easy to prepare foods are still meant for sharing. So, for those of you who have searched, clicked and discovered “A Tasty Thought by JG” there is now an opportunity to become a “Follower” of this Blog. Methods and directions for Grilled Haddock, Grilled Sockeye Salmon and Mailing Homemade Cookies are still clicks away. More recipes await! No More Freezer Jam Left? 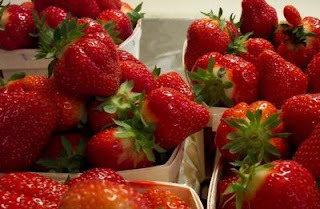 Here in the Pioneer Valley during the month of June the fields of fresh, juicy strawberries will be ready to be picked. Roadside stands will also be selling the local sweet, red strawberries. This is a very pleasant thought, because as of two weeks ago our supply of Freezer Jam is gone. Yes, I did purchase a jar of strawberry jam in the grocery store, but it really does not taste as good as the delicious colorful jam that I prepared and we enjoyed all this past year. Have you ever made Freezer Jam? What flavor do you make? The three flavors I prepare and freeze are Strawberry, Blueberry and Peach. Before the season starts I purchase the needed supplies. It is so much easier to have the materials standing by to use when the fruit is ready to be picked. Now is the time for me to pay attention to Sales on the required items. 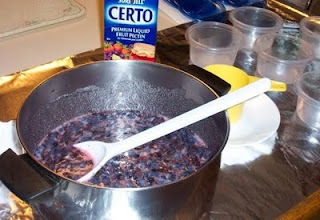 Certo (Liquid Fruit Pectin) will be needed. I use 1- Cup Ziploc Containers. Occasionally, our local grocery stores have specials on Sugar and Ziploc Containers. I might even have a coupon or two to use! Lemon Juice is a staple in my fridge. Suddenly, the local fruit is ready to be picked or purchased and I will be preparing the jam. Before I know it, the season for making Freezer Jam will be here! (Click here for extra hints.) The process is very easy – but the directions in the Certo package need to be followed, exactly. There are no short cuts. Oh, Freezer Jam tastes so much better than the store purchased varieties. It is time to get ready! It is the season for graduations! This reminds me of the blog entry that I posted a year ago for Sherbet Punch. At family gatherings a punch bowl filled with Diet 7-Up and Sherbet is great for guests of all ages. There are two ingredients and it is easy to prepare. Orange, Raspberry and Lime are tasty. 1. In large punch bowl place (1) Quart of Sherbet. This past Sunday was Mother’s Day and my hubby was the chef!!! Nice!!! He used our outdoor grill – even better! These days we eat many meals of fish or of chicken, so enjoying Luscious London Broil that he prepared and grilled was totally a treat! Parsley, Chopped Onion, Garlic Powder, Pepper, Basil, Oregano and (2) Bay Leaves were placed in a Gallon sized Ziploc Bag along with Lemon Juice. After rinsing the meat in cold water, add it into the bag. Carefully, remove the air from the Ziploc Bag and zip. Then place it on a dish and refrigerate the London Broil for at least 3 hours. 5 hours is better. During this time, carefully, turn the bag over at least once and continue refrigerating. Before dinner heat the grill and then remove the meat from the Ziploc Bag. Place the London Broil on a large plate and spread about 2 TBS. Gulden’s Mustard on top. Place this side down on the hot grill. Carefully, place and spread 2 more TBS. Gulden’s Mustard on the meat side facing up. Grill to desired doneness. Place on a clean plate and slice on the diagonal. Luscious London Broil served with a Salad and microwaved Baked Potato – Yummy! If you have been listening to and watching the commercials lately, we have been reminded that Mother’s Day is approaching. As the day gets nearer, we see more advertisements. Moms always enjoy and appreciate an item that their children make. I still have the Macaroni Necklace that my younger son made for me when he was very young. It was quite a few years ago and I will always keep it. Not too long ago my older son stopped in with a container of chocolate chip cookies. What a nice surprise he had baked! Baking a special dessert for mom is a great treat for her! What better time to surprise her than on Mother’s Day? Now, moms do believe in sharing, so if you and other family members will be together, everyone will enjoy the delicious dessert that you have prepared. One of my favorites is Blueberry Delisimo. Ah, there is something about savoring bites of vanilla ice cream, juicy blueberries and white cake. Fresh or frozen (that have been thawed) blueberries can be used. Yes, my husband & my sons have made this dessert! It tasted so good! If you decide to prepare it, do not be fooled by its appearance before it is baked. The result is scrumptious! Another easy but goodie is Creamy Cheesy Pie. The name describes its soft texture. Snickerdoodles are soft cookies that are flavored with cinnamon. It is hard to eat only one cookie. What will you be baking? Suddenly this weekend summer arrived in April! We searched our closets for shorts and short-sleeved shirts. Our outdoor grill was used and it was time to prepare an easy dessert – Creamy Cheesy Pie! My mother-in-law introduced me to this tasty recipe over 30 years ago. One evening after serving it, she confided to me how simple this delicious treat was to prepare. Oh yes, it certainly is! Vanilla flavored or chocolate flavored – Yummy! There are few ingredients needed for this scrumptious dessert – a purchased graham cracker piecrust, a box of pudding (to cook), milk and a bar of cream cheese. For best results - prepare and then chill overnight. Before making this dessert, place the purchased graham cracker piecrust on a large plate. Then, pour the filling into the crust. It is easier to place in the fridge. A slice of Vanilla Creamy Cheesy Pie served with a dollop of whipped cream and a little Freezer Jam! Yummy! The warm sun is shining and the grass is growing here in the Pioneer Valley. Our outdoor grill was used at dinnertime this weekend preparing easy tasty main dishes of grilled fish. Many of you have also been grilling haddock and swordfish. What better time to enjoy them than when our local grocery store offers special sales for the current week? One very simple, yet tasty side dish for grilled fish is Easy Cheesy Noodles. It is a favorite from my childhood. However, now I use “No Yolks” Extra Broad Noodles. Egg noodles can be substituted. I cook half of the package of the dry noodles when preparing this dish. This yummy fare is very easy to prepare! 1. Cook the noodles (desired amount) according to the package directions. 2. After draining the cooked noodles, place them in the cooking pot. 3. Add 2 TBS. Butter/Margarine, a dash of pepper and stir. 4. Then add about 8 oz. Cottage Cheese to the hot noodles. 5. Stir and then cover until serving. 6. Reheating quickly before serving may be needed. The cottage cheese will be quickly heated and some may melt. ***For a special taste use Onion & Chive Low Fat Cottage Cheese! This side dish is so good it became a family favorite years ago. Have you tried it? Craisin/Raisin Twists have become part of my family’s Easter Morning Breakfast! 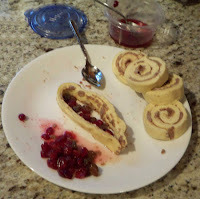 This easy breakfast roll is made using Pillsbury Cinnamon Twists that are located in your supermarket’s Dairy Section. Remove the dough from the container and place the unrolled dough on a plate. Unroll one twist. Fold the strip in half and pinch the ends together. In the middle of the open area, place about 8 Plumped Raisins &/or Plumped Craisins. Gently, squeeze the dough on both sides toward the fruit. Then, twist the dough, making sure the ends are pinched together and place on the foil lined baking sheet. Bake 15 – 16 minutes or until golden brown. 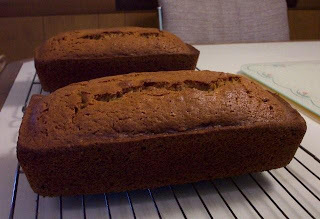 After the Craisin/Raisin Twists have been baked and have cooled on a rack, the tempting icing is spread on top. Now, the Craisin/Raisin Twists can be placed lying flat in a Gallon Size Ziploc Bag and stored in the freezer. Since the first time that I added the plumped craisins and plumped raisins to these “easy to bake” rolls, this is how I always bake them. You might find that one or two twists have been eaten before you have the opportunity to freeze them! ;-) For that reason, I always bake two batches. Quite often, I have a coupon to purchase two containers of the Pillsbury Cinnamon Twists. Do you keep a container of Plumped Raisins and another container of Plumped Craisins in your fridge? The Apple Juice gives the fruit a little extra scrumptious flavoring! They are a delicious addition to many foods! Enjoy the Craisin Raisin Twists! March Madness! The crocuses are up! Spring has arrived! What an exciting time of year! Unfortunately, my favorite college basketball team lost in the first round. But … there is always next year! After this cold winter in Massachusetts it feels great to spend time outdoors. Quick, nutritious and easy to prepare dinners are needed. What can be easier than sauteeing breaded chicken tenders in olive oil? Last night we enjoyed a simple, easy, yet delicious meal – Breaded Chicken Tidbits. Dinner was ready quickly! 1. Place 1 Cup Seasoned Bread Crumbs in a Gallon Size Ziploc Bag. 2. Rinse about 1 and ½ lbs. of Chicken Tenders in cold water. 3. Place Chicken in Ziploc Bag and coat. 4. Heat about 3 TBS. Olive Oil in large skillet low/medium heat. 5. Place Breaded Chicken in heated olive oil. 6. Sautee about 3-4 Minutes. 7. Turn chicken over and sautee the other side 3-4 Minutes or until done. We enjoyed this appetizing tender chicken along with a microwaved “Baked Potato” and a Fresh Garden Salad. Easy, tender, scrumptious and full of flavor! This was a great dinner on a sunny evening in the Spring! After preparing Awesome Oatmeal Pancakes is there one cup of buttermilk remaining in the container? How do you use that one remaining cup? Last weekend I located an easy Irish Soda Bread recipe that requires one cup of buttermilk. Thank you, Charli and Me, for posting the absolutely delicious raisin filled bread recipe. In my (gas) oven I needed to bake the bread an extra 15 minutes at 375°F. This weekend I baked two more Irish Soda Breads to share with my family. I know how I will always use the remaining cup of buttermilk! 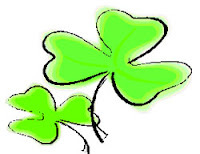 Ah, St. Patrick’s Day will be arriving within hours! A very quick sweet treat to prepare is Sherbet Punch made with Lime Sherbet. Lime flavored Simply Delicious served with a small topping of whipped cream is also so good! 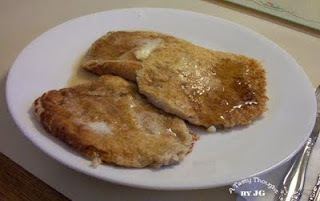 These easy recipes are found by clicking on the bolded links.